With M & m in Mumbai, I stay at work longer, workout harder and run further. With friends, I laze around more; that means less blogging. But I want to share this beautiful pic of a bookseller I met in Goa. We were on our way back to the Ramnathi Devasthan after visiting some Konkani temples. On the rural stretch, the driver pulled over to a roadside bookstall for a newspaper. I followed, wondering if here in the heart of Konkani Goa, I could find some of our Hindu scriptures. For long I wanted a “loose-leaf” version of the Devi Mahatmyam – the popular scripture detailing the genesis of the mother goddess, Devi. The kind used by priests for parayaN (chanting) in temples. 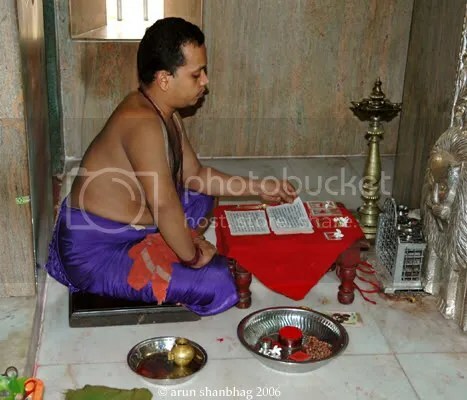 Here, a priest at the Ramnathi Devasthan recites the Devi Mahatmyam from a loose-leaf manuscript. The store was past its heyday. About fifteen different newspapers in english, kannada and devnagiri script were fanned across the front counter. But shelves in the store itself were all empty and in darkness. I asked the young man in Konkani if he carried a loose-leaf version of the Devi Mahatmyam. He shook his head, but still went to check. When he returned, I didn’t take no for an answer and sent him back to check if he had a regular bound copy. Then, interestingly, he returned and asked me to proceed through the side gate into his home in the back. His father wanted to see me! I walked through the yard and into the foyer, where an elderly women offered me a seat. An older gentleman ambled in, greeted and introduced himself and led me to the adjoining store room. It was an old dusty room with wooden shelves. Sunlight streaked through a window and a glass pane wedged in the terracotta roof. Shelves around the room were stacked with books, many packs still wrapped in brown paper and covered in dust. These had remained undisturbed for years. He searched through the shelves and pulled a beautiful loose-leaf copy of the Devi Mahatmyam. Then as he looked on puzzled, I ransacked the place and pulled five more scriptures! 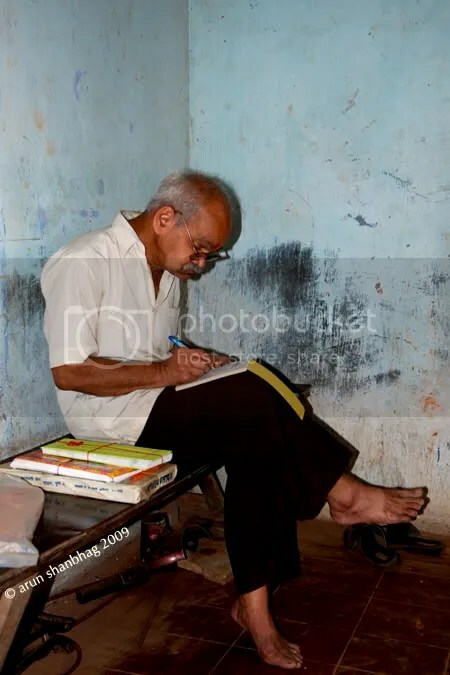 That was Mr Shyamsundar Desai tallying my bill! An invisible hand was guiding me to his shop. The driver had to pull over to this stall; I chose to inquire persistently; then was led to the house. Destiny, Karma, call it what you may! If you are on the back roads of Goa, look for this sign! That was the day of Barack Obama’s inauguration. and sorry to hear of Mr Shyamsundar’s illness. We hope that he will come through this very well and be back to his active life. and yes, will plan on visiting Samarth Agencies in Ponda during our visit in Aug. We usually stay at the Ramnathi – so it will be convenient. I was really touched by his store and his personality ad wanted to write about my experience. Please convey my regards to him. And I will be visiting Goa (and his store again) in Aug. This is so interesting. I have stayed in Priol (2 km from this Shyamsunder place) for 20+ years. He has been our local newspaper supplier for ages now. Brought back lot of memories. That Shyamsunder has an amazing collection of our scriptures! Ask him to show you inside! And nice to know of your kumta connection! Life certainly is interesting and you are fortunate to live in such a beautiful area. Alas, I am back in the US now, was in India on vacation. We know Shyamsundar pretty well, I am sure I have been to his house lot of times (though did not pay any special attention to scriptures), I remember I used to buy Children’s comics from him (Marathi language ones – Kumar; Kishor, Chandoba not sure if you know these, and if they are print any more. Diwali time used to be double bonanza because there used to be special extra fat editions of these books). His son was my Dad’s student in the local school as well. 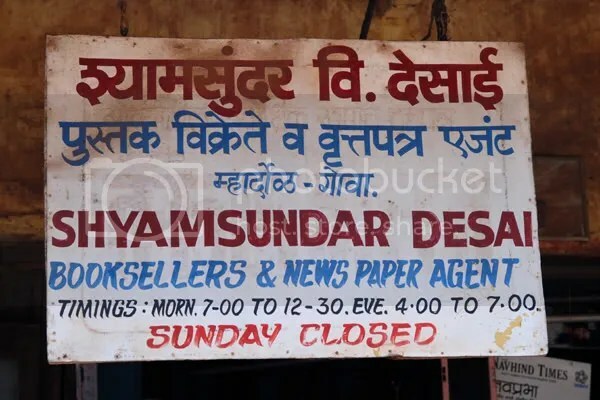 The same famiy has a larger bookstore (and I think as old) in Ponda, called Samarth Agencies. I did grow up in Mumbai and am very familiar with Chandamama! you are right, the FAT Diwali editions were the best, coz there was so much to read. I’d finish the regular monthly issues in a day! Heh! I will most definitely visit Mr ShyamSundar again when I visit Goa in July/Aug. On this last visit I felt restrained in my purchases because of the luggage. perhaps I’ll entice him to ship the books back to mumbai for me. Yes, Kumta is the bestest! also the info on Samarth Agencies ~ will visit as we usually spend a night at the Ramnathi Devasthan. Bestest to you! … and hope our paths cross. yeah these are the places that you find little gems of books!! … and who knows, I may find more gems! Thank you Manasi for sharing your thoughts! There are many aspects of my life that I NEED to now show more grit and will; and hopefully those too will come to pass! Your comment actually reminded me, that hope is a weapon and we should never, ever give up! Yaay! I totally agree with Deepa, I have experinced this I mean I wont be able to explain how(not that I am concealing something). If you wish something deeply or desire spiritually it really comes true. I am incapable at describing…. It is not some kind of chamatkaar but our willpower, our grit can lead us to the desired. Arun, what a beautiful story! Thanks so much for sharing! It was Mother Devi herself, who listened to your heart’s longing, and offered you the loose-leaf version of the Devi Mahatmyam. That book is a power object itself ! Filled with Mother’s incredible love, energy, and power. Enjoy! but you say things so beautifully! Love the Devi Mahatmyam; the Devi in all her myriad manifestations! What a thrill this life is! and one of these days, we will meet! Spring and Summer are great times to be in Boston – hopefully M&m will be here by then. Ok, that’s it. Need to visit your place in very near future. Can’t wait to see the scriptures you picked up. Please do post some more details on same. M&M .. like the ‘sweet’ sound of it. My rgds to them. Absolutely Vishu; Haven’t seen you guys in ages! Hopefully M&m will be here soon and we can do a Meera tour! Stay Well! and Regards to rest! Beautiful inspiring story and the photo says it all! To me these are the rare fragments of evidence that ‘real’ life exists to keep me going on..following our pure souls leads us to these enlightening pearls of beauty! Yes! Yes! Yes! ‘Real’ life does exist! I just need to escape these trappings of wants, desires and else. One of these days! Thank you providing this thought! It gave me goosebumps, reading the story. And what a great photo! Love it. *sighs* coz I know what you mean! I keep wishing my life were sightly different! … perhaps it is; I’m just not reading the signs clearly enough! Thank you Ujwal; Sorry for the delay in replying! My mother complains that I am ‘wierd’ in many ways! Perhaps its that eye for specific detail ! :-)) Ha hA! This reminds me: are there any English translations of the scriptures that you could recommend off-hand? Pretty much for any of the scriptures. It’s hard to know which of the many versions are accurate; also, some of them are really Victorian in style, and others are really vague and hippie-like. Your translations are very good, which is why I thought to ask. Thank you – you are kind! You say it well – most of the translation are “Victorian” and very difficult for us to comprehend and internalize; they further don’t do justice to the beauty of the verses. BTW, this was the impetus for me to start translating some of our common prayers. The director and author, Prof Kashyap is a Harvard trained professor who has a beautiful flair for revealing the inner meaning of our scriptures! I have their translation of the Yajur Veda and the Rig Veda! Simply Exquisite! Swami Chidbhavananda of the Chinmaya Mission. I do have about 10 different translations, and this is the best. The one I have multiple copies of and gift to family and friends! The Ramakrishna Mission in Chennai, India has a decent translation of the Devi Mahatmyam and is available for a pittance. I have an extra copy which I could send to you if you want. … I am completely fascinated by the Devi and all her forms, temples and spirituality! Thus translating the Devi Mahatmyam is one of my short term goals. It may take many years. 🙂 Thus I have about eight different versions of the DM, to cross check and confirm. PS, sorry for taking my time in replying to your query! heh! Good to know that you actually followed up on those! … and I will get to that translation! really! … and take care of Meera! … and in such magnificent ways! I am ever in awe! You take the most wonderful trips 🙂 and you have an eye for the most wonderful subjects. THank you Mala for giving me so much credit; See, I have been to Goa so mny time, we don’t even go to the big cities or beaches anymore; I m done photographing the routine tourist stuff. And it is when you are not really searching or looking, that life is staring you in the face. I just try and keep alert; Certainly in your travels, you have passed such stores. As I mentioned, it was destiny that led in inside … to a wonderful experience. Try it on y our next trip. Don’t want! let things just happen! When friends are travelling to India for the first time, I tell them if they open their hearts and their minds to India, magical things will happen. You are right, Arun. You can’t “want” or “expect”. You just have to let it happen.